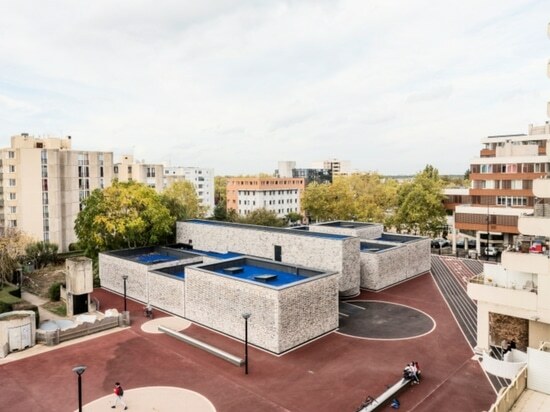 The new Élancourt Music School has taken up residence in the former ecumenical center of the Sept Mares neighborhood, one of the focal points founding the new town of Saint-Quentin en Yvelines. The building was originally a house of worship, a simple, without ornament and inward-looking construction owing to the peace and quiet required by its function. 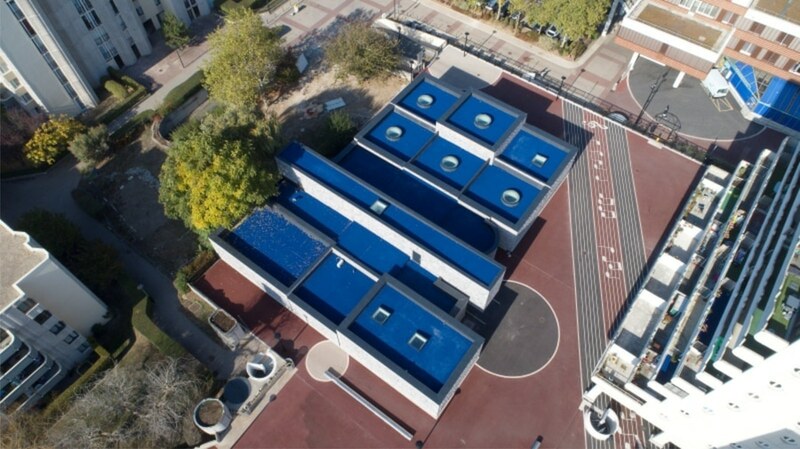 Philippe Deslandes built it between 1974 and 1977, with the desire that it embody the qualities of simplicity, modularity and anonymity. 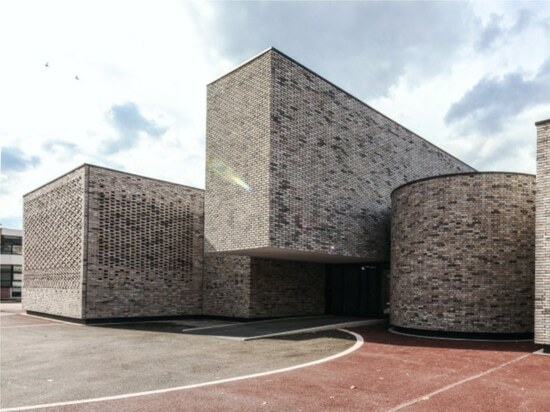 Concrete and brick are the two materials present throughout the school. 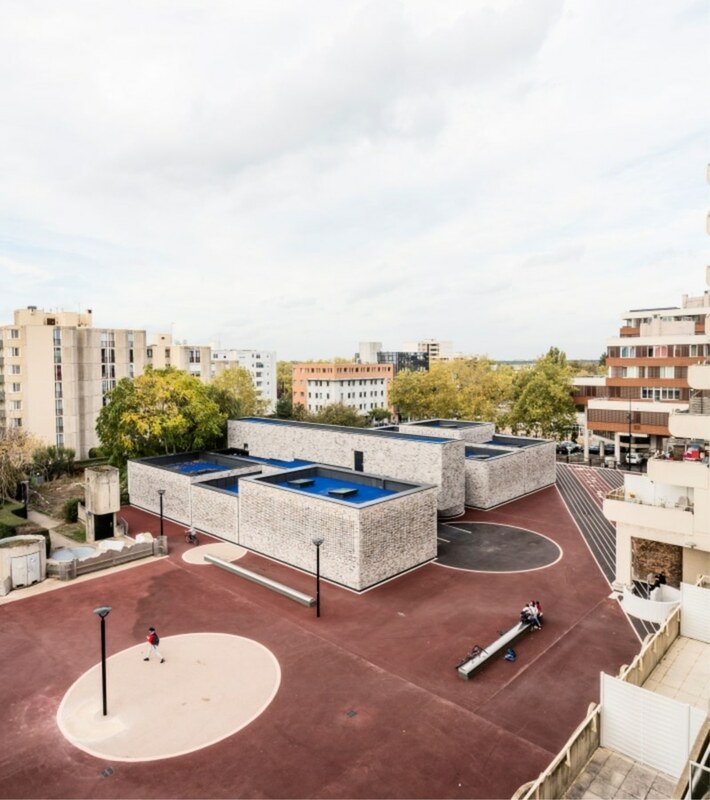 The central and open position of the building makes it easy to visually locate in the neighborhood, which facilitated its adaptation to the new vocation of music school, serving as both a focal point of cultural life and a warm and inviting meeting place. 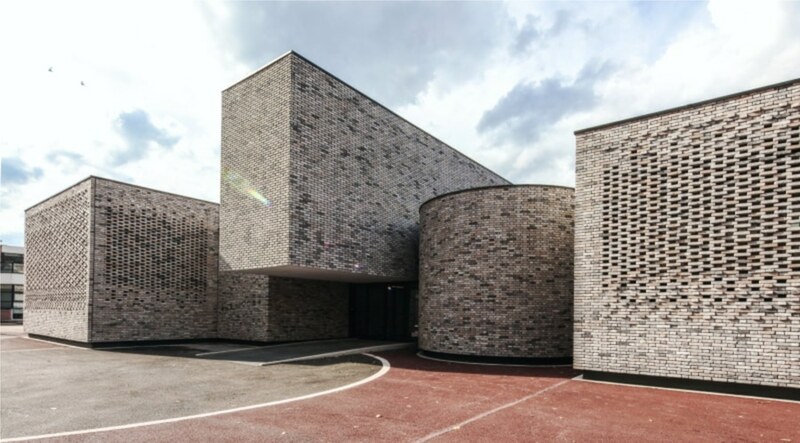 The use of brick in the rehabilitation project made it possible to retain the building’s original architectural principle and its inward-looking and private character. The architects chose to seamlessly clad all the façades entirely with new bricks, treating the walls as “moucharabiehs” in front of the windows, counterbalancing the complexity of the volumes through the complete material unity of the envelop. The hand-molded bricks are laid with a mortarless technique. Nuances of color enliven and modulate this continuous skin. Come the night, the shimmering interior lighting system expresses the softness and serenity of this institution of learning and practice. 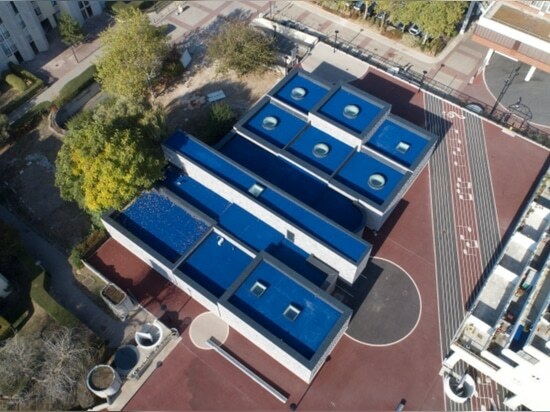 The fifth façade visible to all the surrounding taller apartment houses is treated as a deep blue synthetic lawn, evoking the blue note, immediately signaling the identity of the facility and forming a patch of color in the center of the esplanade. Light wells flood the interior with a soft natural light, balancing the natural light penetrating through the moucharabiehs and endowing each room with a greater feeling of privacy. The architects sought, through the harmonious, luminous and attractive treatment of the interior spaces, to transform the building’s austere appearance into something more appealing to a younger public. They achieved this by focusing on fluidity of circulations, quality of volumes, light and materials, thereby turning the building into a harmonious space of pleasure and fulfilment. Restraint and interiority characterize this repurposing project, which does not seek to stand out, but rather to lightly restore its place in the center of the town, to endow it with greater and lasting dignity and to kindle desire and curiosity, encouraging people to enter. Source by OPUS 5 Architectes.